Benefiting from the collapse of the philosophical, theological and social foundations of the Frankish and Russian civilizations, Marxists continually bombard the Christianity of Europe and Russia as a mighty factor in the subjugation of the serfs, without observing that the Frankish occupiers banished the Romans from the hierarchy and the abbacy, becoming themselves bishops and abbots in order to govern in this way within the Church the occupied Romans. 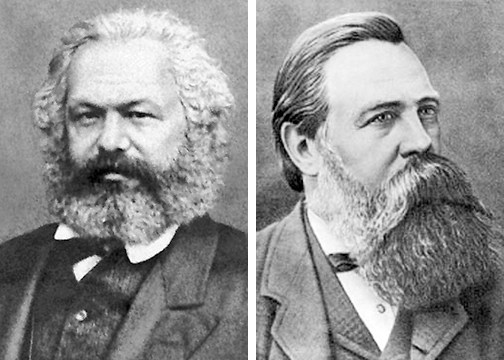 The founders of Communism, Marx and Engels, lived at a time when the above written origins of the class distinctions of the Franks was not known. This is why they simply gave an economic explanation of the origins of European feudalism. Thus they developed an abstract philosophy regarding the evolution of economics and class distinctions, which is neither correct nor is it possible to be applied as an interpretive key to the history of all peoples, as they think. Believing dogmatically and falsely, as we have seen, that Romiosini has the same philosophical, theological and social foundations with the Franks and Russians, Marxists brought to Greece their arsenal of trivial arguments and began their siege of Romiosini. The Romans could have escaped the sufferings of the Turkish occupation if they had become Turks. They were enslaved, because they refused to change their faith! Not because they were enslaved to the rich. As Turks the Romans would have at least been free if not richer. But as Romans they wanted to be free as Christians and not as Muslims. If the Turks were atheist Marxists, the Romans of 1821 would have battled against them with the same steel determination. As we have seen, it is very much advantageous in Russia to associate the 25th of March not with the Fall of Constantinople, when we became enslaved as Romans and became free as Romans, but as an enslavement of the Greeks to Romiosini and the Ecumenical Patriarchate. In order for the people to not become indignant, the agents of the Russians forged history made a distinction between Romans and non-existent Byzantines. In this way the Roman Greeks are enslaved to the Byzantines and to the Byzantine Ecumenical Patriarchate. Thus was established the advantage especially for the Russian design, that the Turks took Constantinople not from the Greeks, but from the Byzantines.